Whether by luck or coincidence, it doesn’t matter! We believe in both! Maybe you Googled: ‘Krag Maga’, ‘Krab Maga’, ‘Israeli Martial Art’, ‘Israeli Ju-jitsu’, ‘best self-defence system’, yet we hope that you heard about our incredible Active Krav Maga community. Something grabbed you and spoke to the part of you that wanted to know more! Many of our members tell us they waited far too long to take action and this is still their biggest regret. The good news… you’re here now. Training Krav Maga is a life-changing experience that gives you more confidence, focus, gets you fitter and ready to take on life’s challenges, big or small. Whatever you are looking to achieve, from reducing your stress levels, gaining new friends to learning practical self-defence skills to protect yourself and your loved ones, Active Krav Maga provides a safe and ‘non-judgemental’ environment for you to progress at your own level. Trying something new is challenging, but don’t worry! Even if you come in by yourself you will not be alone! Our dedicated Active Krav Maga Ambassadors and senior members will help you fit right in. You’ll be in good hands and quickly see that you have made a great decision. Our team loves meeting new people, helping them to conquer their fears, fulfil their lifestyle goals and share Krav Maga with them. One session and you’ll know why we’re so passionate about the Active Krav Maga community. And you will be too! We look forward to meeting you and finding out what you would like to achieve, and how we can help you. 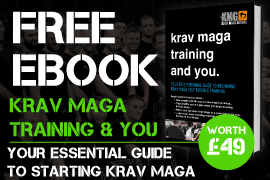 WANT TO LEARN MORE ABOUT KRAV MAGA? I do not wish to be contacted by phone. This is where we will send your eBook. Where would you be most interested in training? Book your Membership Experience or one of our workshops. Reserving your spot takes 2 minutes, just click the button below. Don’t take our word for it, listen to our members! YOU CAN BOTH FOLLOW US AND JOIN US!